250 Custom Bumper Stickers, prices starting at $139.34. The best way to show off a design, make a statement or slap on a portable billboard. The back of a vehicle on a bumper is the best location to show off your brand. Let us help make just the right custom bumper sticker for your needs. Our stickers are super easy to remove! UV Lamination protects stickers against abrasion and fading and provide outdoor durability. We can match 95% of the Pantone colors very closely. We offer free custom shapes for all of our custom shaped stickers. Our custom bumper stickers come with rounded corners. With a rounded corner, you can peel and apply with ease and also your stickers will stay put and not roll up. StickerGiant makes three types of custom printed bumper stickers. Choose from three options. 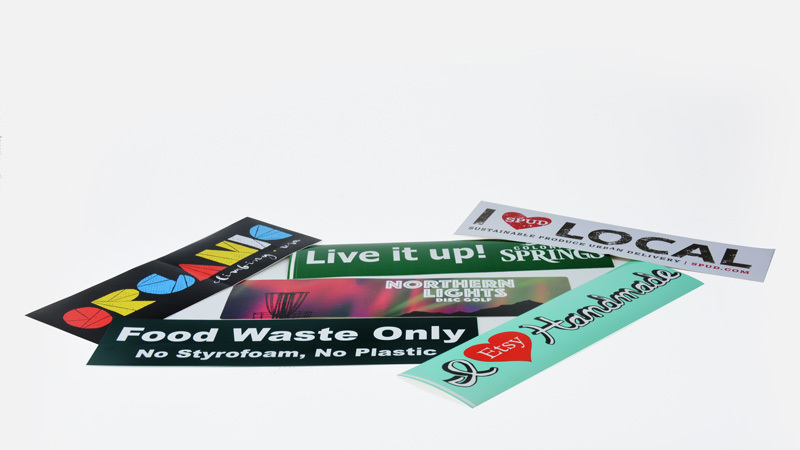 Digitally printed bumpers stickers in full color and custom die-cut shapes and sizes at no extra charge. Flexographic 1 or 2 Color bumper stickers, which are the cheapest sticker to produce but have limited color options. Silkscreen Printed, the most durable and the highest quality bumper sticker.